What a dear little church! It sits among cottages at the end of a lane from the village street, the south side unfortunately cleared of headstones to make a lawn, although this does create the effect of a garden. 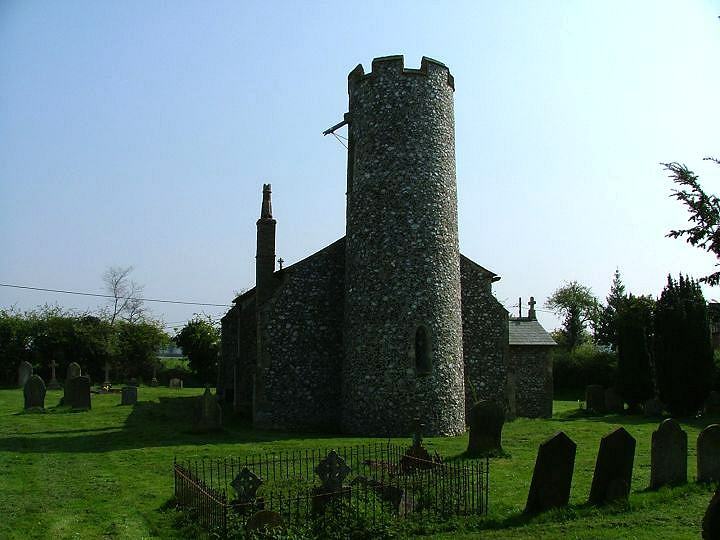 The building is absolutely tiny, but everything is to scale; the round tower is the narrowest in England, the buttressing is slender yet solid. The whole thing was substantially restored inside and out in the 19th century - the round tower was completely rebuilt in 1849 - but there are a couple of interesting medieval details inside. The most westerly bench back on the south side, dated 1531, has symbols of the wounds of Christ, as at Fressingfield in Suffolk, and the animal bench ends against the former north door are also medieval, although the two beasts themselves are restorations. The east window, of the women finding the tomb empty, is a delight. The three Marys have never looked so lovely, and the angel is absolutely gorgeous. She lounges back in the tomb mouth displaying just enough ankle to entice, while barely summoning up the energy to point heavenwards. During dull sermons, this window must have proved something of a distraction to the repressed Edwardian male. Big Norman doorways have been shortened and narrowed a few centuries later. Up in the tiny sanctuary, the 1591 tomb to Honor Bacon is sandwiched against the sedilia and piscina, presumably partly to stop them being used, but also because there simply isn't anywhere else for it to go. Another curiosity is the birdbath font, which I take to be 20th century. You might also notice how tiny the pulpit is, but exactly in proportion, as if this was a show house and they were trying to make it seem bigger than it actually is. There were two cheery, ancient parishioners inside doing the flowers for Sunday, one an extraordinarily old bloke who found it amazing that I'd come all the way from Ipswich ("Hear that, Rose? This man's come all the way from Ipswich! Imagine that! ", all in the broadest Norfolk accents). The church is so small that we had to keep apologising to each other for getting in the way ("Excuse me, after you","no that's alright, after you! ", "can I just get through, I'm not in your way am I?" and so on). What lovely people! But goodness knows what it's like on a Sunday when they get a congregation in there.